Ships from and sold by klampron14. Comment: Clean book with light bends in spine from reading and may have a bookstore stamp inside the cover. Quick response! Featuring yoga as a curative path for the hurt caused by the loss of a partner either through death, separation, or divorce, this guidebook uses meditation and poses to help during or during this painful and difficult period. By focusing on the seven emotional stages of separation and articulating how to move from the first to the last, the healing energies in this bookfrom gentle warm-up poses through more active asanas to final relaxation and meditationoffer positive therapy to anyone who is or has been involved in this painful situation. The personal stories in the first part of the book provide comfort and a sense of community. Michelle Paisley Reed is a world-renowned author, inspirational speaker, and spiritual channel. She is the writer of four screenplays and five books (and counting), including the non-fiction international sensation "Yoga for a Broken Heart: A Spiritual Guide to Healing from Break-up, Loss, Death or Divorce," and the fictional series "All In Her Head," and "All Over It." Books with The Power of 10 include "Manifesting Miracles and Money: How to Achieve Peace, Purpose, and Plenty Without Getting in Your Own Way," and "Beyond Manifestation: Lessons from The Power of 10" (working title). A former news journalist/editor, certified Ashtanga Vinyasa yoga instructor, and professional psychic medium, she has been interviewed on countless major network TV news shows, radio, newspaper, magazines, and blogs. The author has witten a book, both about learning from life's lessons and how to practice yoga as a healing tool. Ms Paisley-Hicks has opened her heart and shared very personal experiences from her life. She goes on to share the certain yoga poses which helped her then and continue to help her now with her new life's lessons. The yoga poses are practical and can be integrated in our daily activites as we travel on our life's learning path, as well. I bought several for gifts for my girl friends and they loved it also. It will stay in my library as an ongoing reference book for when I need a gentle reminder to practice my yoga and continue to roll with life's punches. 5.0 out of 5 starsKeep this close by! I appreciated this book! I keep Yoga for a Broken Heart available at all times to pull out and incorporate an asana into my meditation practice, go through the entire sequence, or when I could use an energy boost or powerful, quiet moment of connection. The intentions of healing and acceptance in this book are heartwarming and a great reminder, and I find the photographs an extremely useful guide. Love the simplicity and heartwarming story. Michelle is a fantastic writer and has a way to make you feel as if you're IN the story. He other books just keep getting better and better and I look forward to them on the big screen someday! 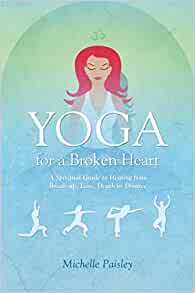 "Yoga for a Broken Heart" could have been written by anyone of us who has gone through disappointment and heartbreak. We disappoint and hurt ourselves, and each other, oftentimes unknowingly. Michelle Paisley happens to have had enough "chutzpah" to write about what she has gone through so the rest of us can have tools to help ourselves when we experience these types of heartaches and disappointments. For centuries yoga has been used to lessen and oftentimes remove emotional and/or physical blockages. Many people still feel it's a "religion" but the truth is, yoga simply means "union" with our emotional and physical selves. The asanas (postures) described in Michelle's book are essential in helping us to open our hearts, minds and bodies so we heal, let go, and learn to move on. I highly recommend this book for you or anyone you know, who needs to learn to "let go" so they can create for themselves, the quality of life they most want and deserve. Although this book does offer many asanas, the author never specifically says why each pose is beneficial. And all of the poses offered are part of any standard yoga practice, so it felt like there was no new information. The first part of the book details her own experience of loss, but I found it flippant and shallow reading for someone who is smack in the middle of a significant loss. I returned this book. This had nothing to do with yoga.